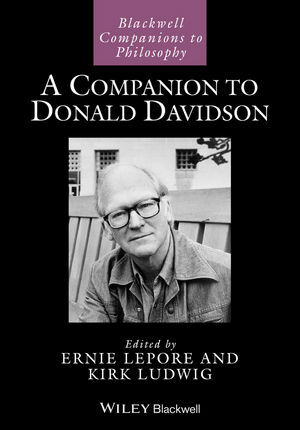 A Companion to Donald Davidson presents newly commissioned essays by leading figures within contemporary philosophy. Taken together, they provide a comprehensive overview of Davidson’s work across its full range, and an assessment of his many contributions to philosophy. Ernie Lepore is an American philosopher and cognitive scientist. He is currently Acting Director of the Rutgers Center for Cognitive Science, and a professor at Rutgers University. He is the co-author with Herman Cappelen of Insensitive Semantics (Blackwell, 2004) and Language Turned On Itself (2007) and co-author with Kirk Ludwig of Donald Davidson: Meaning, Truth, Language and Reality (2005) and Donald Davidson’s Truth-theoretic Semantics (2007). He is editor of the Handbook of Philosophy of Language (with B. Smith, 2006) and general editor of the Blackwell series Philosophers and Their Critics. Kirk Ludwig is Professor of Philosophy at Indiana University, Bloomington. He earned his PhD from the University of California, Berkeley, under the direction of Donald Davidson. He is the editor of the volume on Donald Davidson (2003) in the Cambridge Contemporary Philosophy in Focus series, and he is co-author with Ernie Lepore (Rutgers) of Donald Davidson: Meaning, Truth, Language and Reality (2005) and Donald Davidson’s Truth-theoretic Semantics (2007).